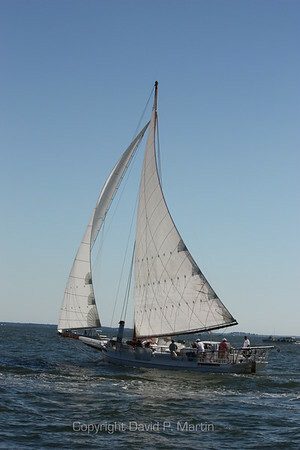 The skipjack is a flat-bottomed, working sailboat, designed and built to dredge oysters in the Chesapeake Bay. It is estimated that at one time there were hundreds of skipjacks (some say thousands) working the bay. Now there are less than 25 and only a few of these are actually dredging. They average 50 feet in length with the beam being about one third the length for stability. They have a centerboard instead of a keel so they can easily navigate the shallow waters of the bay. A large sail catches even a light breeze and provides the power to pull the oyster dredge. The sail is attached to a single, log mast by rings of wood or steel that allow it to be dropped quickly in the event of a sudden blow. A jib is attached to the bowsprit. In a tradition going back over 50 years, the skipjacks gather at Deal Island, MD, each Labor Day for a race. The year that each photograph was taken is in the caption. The skipjack Rebecca T. Ruark under full sail.